The history of the Arabian horse is a most intriguing one and one that dates back many centuries. Throughout this time, there have been many that have become famous. But part of the recognition for this has to go to those organisations that have devoted themselves to this particular breed of horse. There are many different types of Arabian Organisations in all parts of the world. They have taken on many responsibilities and tasks that contribute to this breed. One of the many tasks is maintaining the recognition of the breed. Also, many of those involved in the Arabian horse industry make significant contributions through the provision of scholarships and other ways of giving back to the communities that they serve. When one is showing an interest in some of the famous Arabian horses, it is only fitting to go back in time. A good example is taking a look at the Battle of Semakh, which means going back one hundred years. The Light Horse was the famed horse during this event. The Light Horse Regiment relied on warm-blooded horses to lead them into battle. Among the selection of the warm-blooded horses were the Arabians. Famous by Myth or by Fact? There are a lot of myths that encompass the Arabian horse breed. Some of which have made this breed of horse famous. 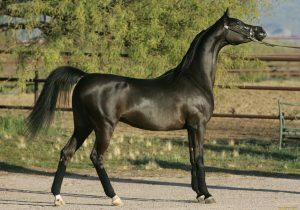 An example of this is the Arabian mare named Safanad given to King Solomon by the Queen of Sheeba. Then getting to the facts, one would have to include Marengo, who was the Arabian stallion famous as a war horse ridden by Napoleon. Aside from the accomplishments that an Arabian horse may be known for, it is often the price that they are sold for that can boost them up in the status of fame. Going back to the 1980s, many Arabian horses sold for some hefty prices. NH Love Potion who was an Arabian mare sold for $2.56 million, while the stallion Padron brought in an astounding $11,000,000. For those interested in the here and now, when it comes to famous Arabian horses, the name Maarwan Al Shaqab is going to come to the forefront. This horse is being claimed as the most famous Arabian horse currently existing on earth. The horse’s home is the Royal Stables of Qatar. There are many different reasons that can occur that will allow an Arabian horse to lay claim to fame. It could be the winning of an important race. Or, it could be the bloodline for breeding purposes. But, most would agree that fame really belongs to this breed of horse based on their natural beauty and impressive characteristics.